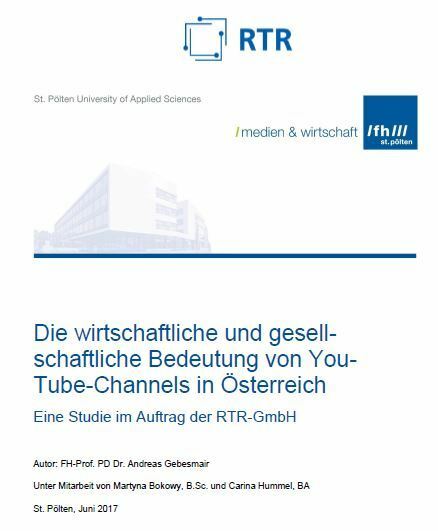 In July 2017, RTR, the organisation providing support for the Austrian Communications Authority KommAustria, published for the first time a study on the economic and societal relevance of YouTube channels in Austria. The study, commissionned by RTR at the initiative of KommAustria and authored by Professor Andreas Gebesmair with Martyna Bokowy and Carina Hummel, from the St. Pölten University of Applied Sciences, aims at providing a first overview of the offer of channels on YouTube in Austria based on an analysis of a sample of the 100 most subscribed channels and the 100 most viewed self-produced videos of YouTubers among the "Comedy", "Entertainment", "Gaming", HowTo & Style" and People & Blogs" genres. Channels are fed very regularly: 31% of them publish videos once or twice a week, 28% more than twice a week and 11% daily or more. On average, the Austrian top providers have 400 videos on their channel. On almost half of the channels, English is the dominant language, thus indicating that the majority of Austrian providers target the international market. More than two thirds of channel providers are also represented on social media platforms Google+, Facebook, Instagram and Twitter. 84% of channels show own productions. Only 14% of the channels are operated by companies. The number of subscribers varies widely. Only 4 of the top-100 channels have more than 1 million subscribers, 23 between 200.000 and one million and 31 between 100.000 and 200.000. In total, the top 100 channels in Austria have 28 million subscribers and 7 billion views. The revenue of the top-100 channels in Austria through YouTube Partner Program are estimated to reach 3 to 7,5 million EUR for the last 12 months (before tax). However, only 44 of the 100 providers are supposedly making a monthly income of 1000-2500 EUR. In addition, 46% of channels earn money through affiliate marketing and 33% through product Placement. 26% offer merchandising products and 20% provide links to crowd funding platforms. Slightly more than half of the channels in the sample get support from multi-channels.networks or other firms. While 54 out of the 100 most-viewed videos of Austrian influencers contain clear product placement, only 9 videos contained any identification. Despite the increasing video offer on YouTube, it is concentrated on a few very popular channels, genres and formats. As there is little relation in the language or content to Austria or its regions, the contribution of these channels to identity-building is negligible.